A 3D surface model is a digital representation of features, either real or hypothetical, in three-dimensional space. Some simple examples of 3D surfaces are a landscape, an urban corridor, gas deposits under the earth, and a network of well depths to determine water table depth. These are all examples of real features, but surfaces could be derived or imaginary. An example of a derived surface is the contaminant levels of a particular bacteria in each well. Those contaminants could be mapped as a 3D surface too. Imaginary examples of 3D surfaces are often the types found in video games or computer simulation environments. A 3D surface is usually derived, or calculated, using specially designed algorithms that sample point, line, or polygon data and convert it into a digital 3D surface. ArcGIS can create and store four types of surface models: raster, triangulated irregular network (TIN), terrain datasets, and LAS datasets. These surface models can be created from a variety of data sources. The two main methods of creating surface models are interpolation and triangulation. There are several interpolation methods to create raster surfaces, such as Inverse Distance Weighted, Spline, Kriging, and Natural Neighbor. You can build triangulated surfaces by creating a TIN, terrain dataset, or LAS dataset. You can also convert between these surface models. Raster, TIN, terrain, and LAS datasets are all types of a functional surface. A functional surface is a continuous field of values that may vary over an infinite number of points. For example, points in an area on the earth's surface may vary in elevation, proximity to a feature, or concentration of a particular chemical. Any of these values may be represented on the z-axis in a three-dimensional x,y,z coordinate system, so they are often called z-values. Surface models allow you to store surface information in a GIS. Because a surface contains an infinite number of points, it is impossible to measure and record the z-value at every point. A surface model approximates a surface by taking a sample of the values at different points on the surface and interpolating the values between these points. The illustration below shows a surface model of chemical concentration across an area. Points show where the concentration was sampled. GIS data can generally be categorized into two major types: raster and vector. Vector data is defined by points, lines, and polygons and their associated relationships that comprise geospatial data. Real-world features and surfaces can be represented as vector data stored in a GIS. Raster data is a rectangular matrix of cells, represented in rows and columns. Each cell represents a defined square area on the earth's surface and holds a value that is static across the entire cell. A surface can be represented as raster data, where each cell in the data represents some value of real-world information. It could be elevation data, contamination concentrations, water table levels, and so on. Raster data can be further subdivided into categories, such as thematic, pictures, or continuous data. Surfaces represented as raster data are a form of continuous data. Continuous data is also referred to as field, nondiscrete, or surface data. A continuous surface represents phenomena in which each location on the surface is a measure of the concentration level or its relationship from a fixed point in space or from an emitting source. Elevation models are one such example of raster surface models. The fixed point may be a spot height derived from photogrammetric methods, but interpolation between heights help form the digital elevation model (DEM). Since raster surfaces are usually stored in grid format with uniformly spaced cells, the smaller the cells, the greater the locational precision of the grid. The example below compares a higher-precision grid (left) to a lower-precision grid (right). The locational precision of individual features—for example, the summit of a mountain—is directly related to the size of the grid cells. In the example above, a very coarse elevation surface data is depicted as a surface model in a two-dimensional, planar view. Raster surfaces can be generated and modeled with other image sources for 3D perspective views as well, such as this high-resolution DEM with hillshade (below). A raster surface is a continuous field of values that may vary over an infinite number of points. For example, points in an area may vary in elevation, proximity to a feature, or concentration of a particular chemical. Any of these values may be represented on the z-axis in a three-dimensional x,y,z coordinate system to produce a continuous 3D surface. Raster surface data represents a surface as a grid of equally sized cells that contain the attribute values for representing the z-value and the x,y location coordinates. When using the ArcGIS 3D Analyst extension for your processing, you will probably consume or create many raster datasets. It is important to understand how a raster dataset is represented in 3D Analyst when working with rasters. TINs have been used by the GIS community for many years and are a digital means to represent surface morphology. TINs are a form of vector-based digital geographic data and are constructed by triangulating a set of vertices (points). The vertices are connected with a series of edges to form a network of triangles. There are different methods of interpolation to form these triangles, such as Delaunay triangulation or distance ordering. ArcGIS supports the Delaunay triangulation method. The resultant triangulation satisfies the Delaunay triangle criterion, which ensures that no vertex lies within the interior of any of the circumcircles of the triangles in the network. If the Delaunay criterion is satisfied everywhere on the TIN, the minimum interior angle of all triangles is maximized. The result is that long, thin triangles are avoided as much as possible. The edges of TINs form contiguous, non-overlapping triangular facets and can be used to capture the position of linear features that play an important role in a surface, such as ridgelines or stream courses. The graphics below show the nodes and edges of a TIN (left) and the nodes, edges, and faces of a TIN (right). Because nodes can be placed irregularly over a surface, TINs can have a higher resolution in areas where a surface is highly variable or where more detail is desired and a lower resolution in areas that are less variable. The input features used to create a TIN remain in the same position as the nodes or edges in the TIN. This allows a TIN to preserve all the precision of the input data while simultaneously modeling the values between known points. You can include precisely located features on a surface—such as mountain peaks, roads, and streams—by using them as input features to the TIN nodes. TIN models are less widely available than raster surface models and tend to be more time consuming to build and process. The cost of obtaining good source data can be high, and processing TINs tends to be less efficient than processing raster data because of the complex data structure. TINs are typically used for high-precision modeling of smaller areas, such as in engineering applications, where they are useful because they allow calculations of planimetric area, surface area, and volume. Remotely sensed elevation data, such as lidar and sonar point measurements, number in the hundreds of thousands to hundreds of millions. Managing and modeling this type of data is cumbersome for most hardware and software available today. The terrain dataset allows a series of rules and conditions to be generated that index source data into an ordered set of TIN pyramids that is generated on the fly. Terrain datasets are an efficient way to manage large point-based data in a geodatabase and produce high-quality, accurate surfaces on the fly. Lidar, sonar, and elevation measurements can number from several hundred thousand to many billions of points. Organizing, cataloging, and generating 3D products from these types of data is difficult at best and prohibitive in many cases. Terrain datasets allow you to overcome these data management hurdles, edit your source data, and produce highly accurate TINs at varying resolutions. Rendering very large TINs is generally difficult, partially due to limitations by hardware such as video cards. However, terrains are beneficial in that you render the areas that you need to visualize at an optimized resolution. Thus, if you have a small-scale area in ArcGlobe or ArcMap, fewer nodes will be utilized by the terrain to generate the TIN rendered on your screen. However, if you zoom in to an area at large scale, a full resolution (utilizing all the nodes for that area) will be used to generate a TIN on the fly. The obvious advantage is that only a small portion of the study area is being rendered with large numbers of nodes, or a subsampled collection of nodes is used to generate a lower-resolution TIN on the fly. Terrain datasets are unique in that they can either embed or reference the source data. Through the indexing of each point measurement, a set of TIN pyramids is generated, each set with successively fewer participating nodes (source points). This allows ArcMap and ArcGlobe to generate a TIN on the fly at whatever resolution is needed for the scale of the viewer. Small-scale displays of data require fewer points, and thus, a lower-resolution TIN is rendered. As the viewer zooms in, a smaller area of the dataset is required but at higher resolution. The density of points increases, but performance is not hindered because a high-resolution surface is rendered only for the displayed area. Terrain datasets are supported for reading and viewing at all licensing levels. Terrains can be created with ArcGIS Desktop Standard and Desktop Advanced with the ArcGIS 3D Analyst extension. ArcScene does not support terrain datasets. What is a terrain dataset? A LAS dataset stores reference to one or more LAS files on disk, as well as to additional surface features. A LAS file is an industry standard binary format for storing airborne lidar data. The LAS dataset allows you to examine LAS files, in their native format, quickly and easily, providing detailed statistics and area coverage of the lidar data contained in the LAS files. A LAS dataset can also store reference to feature classes containing surface constraints. Surface constraints are breaklines, water polygons, area boundaries, or any other type of surface feature that is to be enforced in the LAS dataset. A LAS file contains lidar point cloud data. 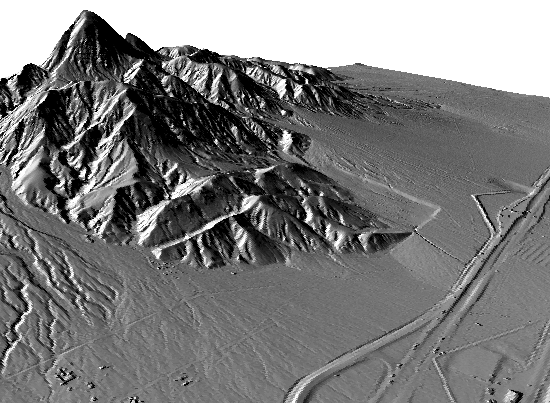 For more information on LAS files, see: Storing lidar data.